Luxor Las Vegas is a 30-story hotel, which is operated by MGM Resorts International, features a 120,000 sq ft (11,000 m2) casino floor that includes over 2,000 slot machines and 87 table games. It has a new, highly modernized and contemporary design and contains a total of 4,400 rooms, including 442 suites, lining the interior walls of a pyramid style tower and within twin 22-story ziggurat towers that were built as later additions. The hotel is named after the city of Luxor (ancient Thebes) in Egypt. 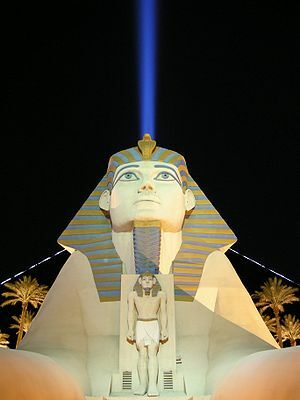 Luxor is the second largest hotel in Las Vegas (the largest being the MGM Grand Las Vegas) and the third largest in the world. As of 2010, the Luxor has a 4 Key rating from the Green Key Eco-Rating Program, which evaluates “sustainable” hotel operations. Casino: Yes, 120,000 square feet. Casino games include Blackjack, Craps, Roulette, Baccarat, Pai Gow Poker, Poker, Slots, Video Poker and Megabucks. The casino has a poker room. Race & Sports Book: Yes, a non-smoking, 110-seat race and sports book, equipped with 128 individual monitors and 5 big-screen televisions. Restaurants: The Luxor has the following dining options: Backstage Deli, TENDER Steak & Seafood, Pyramid Cafe, Rice & Company, , T & T Tacos & Tequila, the Luxor Food Court, Starbucks and the More the Buffet at the Luxor. Entertainment: Entertainment is featured throughout the Luxor. The Luxor Theater has CRISS ANGEL Believe. The Atrium Showroom features Carrot Top, Menopause the Musical and Fantasy. Nightlife: CatHouse Loungerie, LAX, Flight, Aurora, Liquidity, Playbar and High Bar. Attractions: Bodies…The Exhibition provides an unusual and up-close look at the human body, while Titanic: The Artifact Exhibition recounts the fateful trip of the world-famous ocean liner. Pool: Yes, a five-acre pool area with four pools and four Jacuzzis. Spa: Yes, Nurture Spa and Salon offers multiple types of massages and services. Shops: The Luxor Galleria is a shopping promenade with numerous retail stores. Fashion 101 is located on the casino floor. LX Fight Shop is located on the atrium level. There also are 41 shops and restaurants located in Mandalay Place, an upscale boutique mall that connects the Luxor to Mandalay Bay. Wedding Services: Yes, the Chapel at Luxor offers a number of wedding ceremony packages. Convention Rooms: Yes, 1,200 square feet to 7,400 square feet with a ballroom at 15,680 square feet. In-Room Internet Access: Yes. In-room high-speed internet access available for a fee. Hotel Amenities: Beauty salon, currency exchange, laundry and luggage services, maid service, safety deposit boxes at front desk ($50 charge for lost key), wake-up calls, valet parking, a walkway to Mandalay Bay (located adjacent to the Luxor Theater) and a walkway to the Excalibur (located in the west tower). Parking Garage: Yes, a two-story parking garage. Standard Room Amenities: Air conditioning, clock radios, remote-controlled cable TV, electronic door locks, hair dryer, iron and ironing board, pay-per-view movies, telephone and voice mail. Incidental Charges: Luxor Hotel & Casino has a $15 per room, per night resort fee which includes: Fun book ($800 value), unlimited local, toll free and domestic long distance calls, in-room internet access, daily newspaper and daily admission to the fitness center (not including use of spa facilities). Hotel requires a $50 per day credit card or a cash deposit for incidental charges.The resort fee listed above does not include tax. Luxor also applies room tax to their resort fee.